Amazon released their quarterly report today and it looks like they have continued their near perfect record for not generating a profit. Today Amazon reported that their operating loss was$25 million last quarter, compared with an operating loss of $28 million in the same period the year before. Their 3rd quarter sales increased by 24% to $17.09 billion, compared with $13.81 billion in third quarter 2012. Their net losses totaled $41 million in the third quarter, compared with a net loss of $274 million in Q3 2012. “It’s been a busy few months—we launched a new Paperwhite and new Kindle Fires to positive reviews and surprised people with the revolutionary Mayday button—average Mayday response times are just 11 seconds!” said Jeff Bezos, founder and CEO of Amazon. In the past quarter Amazon has opened several new warehouses, launched a new Kindle Paperwhite and new Kindle Fire tablets, opened a Kindle Store in Mexico, and (my favorite) deployed 1,382 Kiva robots in three warehouses. Kiva Systems (aka SkyNet's understudy) is a robotics startup that Amazon acquired in March 2012. 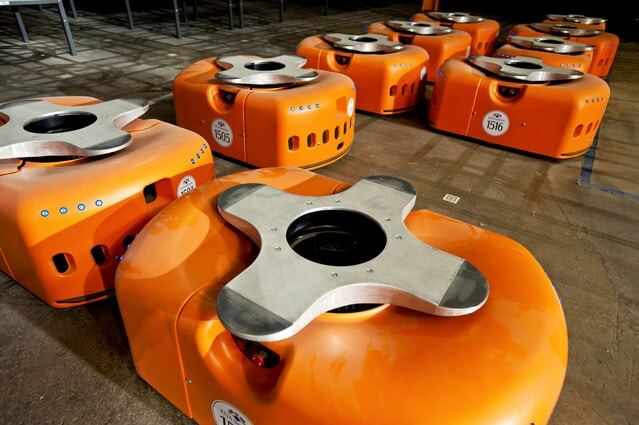 Amazon paid around $800 million to buy the rest of the 10 year old company with the goal of deploying Kiva robots in more of their warehouses. At that time 2 Amazon subsidiaries, Zappos and Diapers.com, were using the robots. In fact, the latter had been using the robots since long before they were acquired by Amazon. The robots contributed to Quidsi's efficiency and productivity to such a degree that Amazon ended up buying Kiva Systems.